I divided the sand tray for sand tray therapy class into four quadrants which represent the four personality color types. The largest section is the green quadrant in which I choose two plastic bracelets that say honor roll and the other has perfect attendance printed on it. I placed laughter in the tray because I am notorious for laughing in all my personality types especially my green type. I placed a clear stone for clarity and trees to represent all of the new knowledge that has been planted and now growing within me over the past few years. The next section in the upper right hand corner is my gold section which I used two wild animals as they prepare to fight, the policemen are prepared to keep order and piece with their guns which are pointed at the wild animals. The yellow tree represents growth and knowledge in this area. 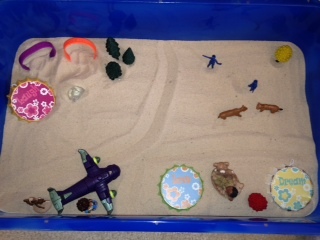 The bottom right portion of the sand tray represents my blue personality type which dreams and loves quite a bit. This personality has a lot of love and compassion for children, such as a mother loving her children. The red tree represents knowledge and growth in this area. The bottom left hand corner represents the orange personality type which represents fun and spontaneity. I am lacking in this area which is why it is the smallest area of the track. The plane represents travel and fun, the little boy (Diego) represents exploring, and the monkeys represents exploring and freedom of space and time.